Habitat : Spread throughout india, ascending upto 1700 m.
Uses : The most common and widespread use is to treat toothache and throat and gum infections. Worldwide the flower heads are used either fresh or dried and powdered, but the use of roots and leaves has been recommended as well. 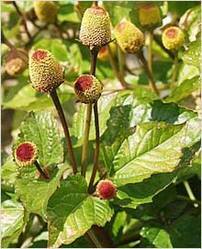 The plant is further recommended as a cure for dysentery and rheumatism, and to enhance the immune system. It increases the flow of saliva and is useful in fever especially during summers. It is used against blood parasites, especially against malaria, both prophylactic and curative. The herb exhibits general immunomodulator properties when used internally, boosting production of leukocytes and antiviral , as well as promoting phagocytosis. The leaves may also used to treat bacterial and fungal skin diseases. The internal use of this herb stimulates an increased rate of phagocytosis. It stimulates wound healing, protects the individual from colds and flu.